As soon as I heard Who in This Room would be published I started hotflashing and eyelid twitching about what the cover would look like. Handing over control has never been easy for me. Fortunately, the lovely and utterly-reasonable people at Calyx agreed to let me pursue a few design ideas and I immediately called my friend, Judy. You may remember Judy of the super-cool tattoo from this post. As soon as we spoke I knew she was the perfect person to create the cover for so many reasons – here are the top ten. 1. She’s so much cooler than I am. Do you need to look at that tattoo again? 2. She’s had breast cancer. 4. 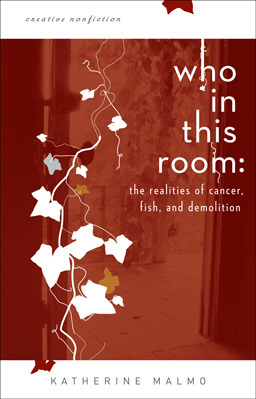 She’d never pick up a book about cancer (unless it was written by a friend who wanted her to design the cover). 5. We both love the television show What Not to Wear. 6. She’s a talented graphic designer. Oh yeah, there’s that. 7. She has a whole cabinet of Japanese anime dolls. At least I think that’s what they are. 8. She designed the logo and image for our friend’s business. I love that logo. BTW – Great cancer/health related blog on her site. 9. She happened to be between projects. How lucky for me! 10. She works FAST. Thank goodness. I’m in love with the end result. Eyelid twitches be gone! Thank you, Judy! This entry was posted in Cancer, Who in This Room, Writing on March 14, 2011 by Katherine. It turned out beautifully. Congratulations to you both! Beautiful. I can’t wait to hold the real thing in my hands. I love it! So beautiful. I love it!! I love the red, an eye catcher for sure. I’m so proud of you Katherine! I’m so excited to read it! I am soo lucky to have you both in my life! Not a pink ribbon in sight! Yay! It looks beautiful. and the publisher approved! horaay!! SEE! Even her comments are cool. I love it! Can’t wait to hold it that real book.